Coverage: Nestling in rolling countryside between the Rivers Creuse and Vienne, on the border of the historic Touraine and Poitou regions, La Belardiere was a working farm until the early 1990s. Today, the barns have been carefully restored to combine both character and classic features with luxurious holiday accommodation. 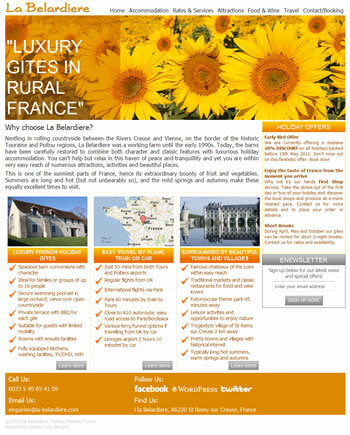 Specification: The client required a clean, bright and eye-catching website to showcase their luxury gites. The also wanted to be able to update the site themselves with latest news and offers, as well as allow people to register for their free newsletter. "I've been working with Carol at Sleepy Frog since 2012 and although we have never met face to face, doing business could not have been easier. Carol asked all the right questions up front and was quickly able to understand my requirements. She has lots of practical ideas and has always made appropriate and helpful solutions. Importantly, she always responds quickly to any queries. I've had many compliments about my website, which says it all. I would most definitely recommend Sleep Frog."